Near the east end of the great Martian rift valley, Valles Marineris, lies a geological disaster area named Hydraotes Chaos. Hydraotes is what geologists term "chaotic terrain". It's instantly recognizable by a rat's nest of mesas, buttes, and hills, chopped through with valleys which in places look almost patterned. Chaotic terrain occurs in numerous locations on Mars, and always gives the strong impression that something abruptly disturbed the ground. That something seems to have been gigantic releases of subsurface water. Many chaos regions lie at the heads of broad, shallow valleys such as Maja, Shalbatana, Ares, Tiu, and Simud Valles, while others form wide places along the course of these channels. Chaotic terrain and floods appear intimately related. The evidence for giant floods was hard for scientists to credit when the channels were discovered nearly 40 years ago. 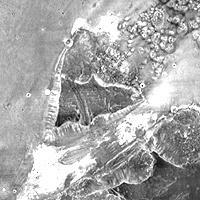 However, imaging from Martian orbit since then has sharpened the picture, with photos detailing scour marks, streamlined islands, large-scale ripple marks, and other telltale features of giant floods. The channels and chaos regions formed long ago. By counting craters (more craters in any given area means an older surface) and by studying the valleys' relations with other geological features, scientists conclude the channels formed 2.0 to 3.8 billion years ago. Hydraotes Chaos measures about 300 kilometers (190 miles) wide by roughly 350 km (220 mi) north-south, and it lies in a valley leading northeast out of Ganges Chasma at the east end of Valles Marineris. Chaotic terrain appears unique to Mars, as Earth has no analogous feature apparently. Hydraotes Chaos isn't the biggest of these geological rubble-piles, but it sinks the deepest and in one respect it's especially valuable for scientists. Scattered across its floor lie numerous small clues to the process that made Hydraotes - and perhaps other chaos regions as well. This image is a mosaic of infrared frames taken during daytime by the Thermal Emission Imaging System (THEMIS) on NASA's Mars Odyssey orbiter. The smallest details THEMIS can see at infrared wavelengths are 100 meters (330 feet) wide. Scientists think chaotic terrain forms when pressurized groundwater, saturating the subsurface, escapes through cracks and faults. The surface becomes undermined and washes away, opening pits along the fault lines that merge to form valleys, as seen in the image at left. Near the surface, the groundwater would likely be frozen, while deeper down where it's warmer, the water would be liquid. Thus if a fault opened a pathway from the underground reservoir up to the surface, the release of pressurized water might be sudden and spectacular. Multiple faults cut across this old impact crater and its neighbors on the plains around Hydraotes. Escaping water has opened pits and small valleys, but the quantity of water was apparently scanty enough - or the faults didn't reach deep enough - that this crater has survived relatively intact. The center of Hydraotes shows the classic landscape of every chaotic region. Here the undermining went far enough that the slab-like plains cracked and broke into hills, mesas, and buttes, isolated by valleys, troughs, and depressions. The mesas in the image at left span roughly 10 to 20 km (6 to 12 mi) wide and stand about 1,000 meters (3,300 ft) above the floor of the valleys. Elevation measurements show that the top surfaces of many buttes, although generally flat, have a tilt in one direction or another. The tilt suggests that faults have caused individual mesas to slide up or down, or to lean to one side, as the chaos developed. Elevation measurements also show that the mesa tops in the center of Hydraotes have sunk about 2,000 meters (6,500 feet) lower than the outside plains. The mesa edges run parallel for many kilometers, showing that the valleys and troughs flanking them widened uniformly. Where this occurs, it suggests groundwater flowed out of the mesa's sides, eroding them evenly. Just inside the rim of Hydraotes, however, large intact mesas like those in the center are hard to find: randomly shaped hills are far more common. This suggests that undermining and collapse worked more powerfully and completely along the edges of Hydraotes than in its center. But what provided the kick to give birth to Hydraotes? In search of answers, scientists focused on small, conical hills seen in places on the floor of chaos region. At first glance, these look like remaining fragments of buttes or mesas. But a closer look (see the THEMIS VIS view at right) points to a different story. These bumps have sizes and shapes that closely resemble terrestrial cinder cones, and they suggest volcanic activity played a role in creating Hydraotes. The basin floor where they appear is the deepest part of Hydraotes, about 3,500 meters (12,000 feet) below the plains outside. It also lies about 5,000 meters (16,000 ft) below Martian "sea level." One scenario describes the history of Hydraotes in four steps. First, an underground sheet of molten lava, called a sill, spreads along weak layers deep beneath what is now Hydraotes. In turn, this forces the crust upward, generating vertical cracks, and melting any subsurface ice. The cracks then provide paths for groundwater to escape, and blocks of crust settle downward along the faults. Depending on how the lava intruded, water may have surged out in several episodes, leaving sedimentary deposits on the floor of the growing basin. Finally, a late burst of volcanic activity in the deepest parts of the basin spawns a crop of cinder cones that dot the floor. Igneous activity left other traces in Hydraotes as well. In a few places, basaltic rocks rich in a greenish mineral called olivine lie exposed on the floor of Hydraotes. Scientists discovered and mapped the olivine using THEMIS images taken in several infrared "colors." Olivine is an igneous mineral that weathers quickly when wet, so finding exposures of it suggests that little water has touched the exposed basalt. Could this be the molten rock that formed the sill undermining Hydraotes? A tempting idea, but probably not what happened. Olivine peeks out in dozens of places in the bottom of other channels on the east side of Valles Marineris. Because it is found in so many places, scientists think it's probably a region-wide layer that was deposited earlier than the formation of Hydraotes. But where is the olivine? At in the daytime infrared image left, the triangular butte (about 25 by 30 km, or 15 by 20 miles) appears to be a tilted block just like one of the large mesas in the center of Hydraotes. But the nighttime infrared view (at right), however, tells a different story. By day or night, THEMIS senses heat radiation from the surface. In nighttime infrared views, light tones show warm areas still holding onto daytime warmth. After sunset on Mars, as on Earth, the ground cools. Surfaces covered in fine granular material - sand or dust - cool faster than exposures of harder and tougher material, such as rock and compacted sediments. You can experience this for yourself by walking barefoot at the beach; after dark the sand surface cools rapidly while the paved parking lot stays warm until late at night. The large white patches you see in the night infrared view are likely exposures of this olivine-rich bedrock, or something almost as compacted. Erosion from wind or floods in the channel has probably stripped off whatever layers covered the olivine and exposed it to THEMIS' view. As happens in so many places on Mars, the landscape of Hydraotes is the result of billions of years of geological construction and destruction. It's a lengthy record any planetary scientist would like to examine in more detail. dot the lowest part of the Hydraotes' floor in this THEMIS visible-light image with 18-meter (59 foot) resolution. The rough-textured apron around the double cone at top is a lava flow roughly 5 km (3 miles) in size. The cinder cones may have been produced in a last-gasp episode of igneous activity, following that which that spawned Hydraotes itself. This nighttime infrared view of the butte and surroundings shows numerous light-toned areas, indicating exposures of bedrock. Multispectral analysis of this THEMIS image identifies the rock as olivine-rich basalt. It is part of a widespread unit that appears in many canyons and channels east of Valles Marineris.